We all know the situation when we need to make quick note to not forget about something that comes in our mind right now. We are using sheet of paper, sticks, maybe you put a note on your hand :-). But in NET.Notes you just slide it from the side and you can write it there. 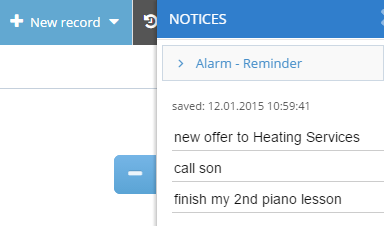 Notice is saved. Quick and easy. Imagine that you call somebody but he is not there and be back in 10 minutes. How to not forget to call again. 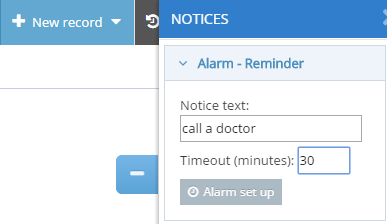 Go to the reminder on the right side, write some text there, set up elapsed minutes and after that time NET.Notes brings up an alert, which reminds you to call again. This come up even if you browser is not open.